The classic “ascent of man” image depicts us evolving from a four-legged ancestor. Yet that doesn’t seem to be the case. Even the earliest members of our family seem to have been competent bipeds. Yet they also have many adaptations for a life in the trees. Some researchers have put two and two together and concluded that maybe they used bipedalism across branches. Now, parkour athletes are helping test this hypothesis. Humans don’t spend much time in the trees (at least, most of us don’t). And for good reason. It really limits the habitats we can live in. By expanding onto the ground we’ve become a worldwide species. Meanwhile, our ape relatives – who are still stuck in the trees – can’t expand beyond the tropics. Our bipedal way of walking seems perfectly suited for such a terrestrial lifestyle. It’s efficient for long distance travel, protects us from the heat, and good over uneven terrain. As such, bipedalism and arborealism were often thought as opposite sides of the coin. We traded in our climbing adaptations for a better time on the ground. And many fossil discoveries seemed to support this conclusion. There’s a general trend from ~4 million years ago of our family getting better at terrestrial bipedalism, loosing arboreal features along the way. For example, at the start of that period we have a grasping thumb; which is great for climbing. By ~2 million years ago it’s rigid and stuck in place, providing a push-off force during walking. However, over the past few decades, this view has been changing. 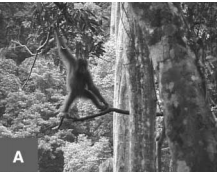 Our skill at bipedalism has improved (and our tree climbing skills have gotten worse). But it seems that we started pretty decent in the first place. Fossils from before that 4 million-year-old improvement period still show some bipedal skill. Sahelanthropus tcahdesis – the oldest known member of our family – has a vertically orientated neckhole indicative of a vertical (and thus bipedal) body. Orrorin tugenensis – the next oldest – has a femur with bipedal adaptations, yet fingers that are curved for hooking onto branches. Ardipithecus ramidus has most of the above, merging arboreal (like long, curved fingers) and bipedal (like the femur) traits. This strange contradiction has typically been viewed as our ancestors using bipedalism in the trees. Then later, it was adapted to being useful on the ground. Eventually, we committed to a life on the ground entirely. Orang-utans have sometimes been used as a model for this, as they will “walk” atop a branch sometimes. Might our ancestors have behaved in a similar way? But orang-utans don’t just use this “walking”. They’ll leap across gaps, swing from trees, and “oscillate” entire trees; bringing them close to their target. Could a bipedal animal also use these other key skills? This is where the parkour athletes come in. As good climbers, they’d be a decent model for testing a bipedal animals capacity for life in the trees. In particular, they’re willing to be hooked up to all sorts of machines. So they can shed light on not just whether such actions are possible, but whether they are energetically efficient. Otherwise, our bipedal ancestors would fall afoul of natural selection. We’d be outcompeted by a quadruped before we even got off the ground (if you’ll pardon the pun). And it turns out parkour athletes are pretty good at climbing stuff. Shocking as that may sound. They could jump, oscillate branches, climb up poles, and do all the other stuff an orang-utan needs to survive. Such are the skills you develop when you commit to the religion of parkour. Crucially, for most of these activities, they performed them very well; from an energetic point of view at least. I can’t really comment on the skill involved given my lack of experience, but I’m sure it was totally tubular. Interestingly, most forms of side-to-side movement had a similar energetic cost. The deciding factor was the strength and stiffness of the branch involved. With a bit of practice, you could pick the optimal movement style for any particular tree. The exception was vertical climbing, which – regardless of how they did it – took vastly more energy than any horizontal movement. Which should be expected, given you’re picking a fight with gravity. This paints a fascinating picture of our ancestors as a group that lived almost entirely in the trees. Perhaps they would avoid the energetic cost of climbing by visiting the ground as little as possible. Of course, before I begin fantasising about our ancestors having a Tarzan-esque lifestyle there are a few drawbacks. 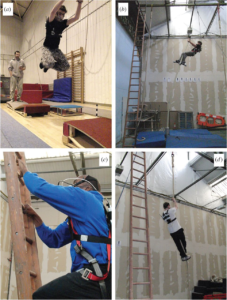 Notably, this research was investigating the energetic cost of climbing with parkour people because chimps are hard to convince to wear scientific equipment. Thus we don’t really have any control group to compare these bipedal species to. It might turn out that, as good as these parkour guys are, bipedalism is actually a rubbish way to get around in the trees. At least now we know that a bipedal species can be good at climbing. Whether we were good enough, time will tell. Halsey, L.G., Coward, S.R. and Thorpe, S.K., 2016. Bridging the gap: parkour athletes provide new insights into locomotion energetics of arboreal apes. Biology Letters, 12(11), p.20160608. Lovejoy, C. O., Suwa, G., Spurlock, L., Asfaw, B., & White, T. D. (2009). The pelvis and femur of Ardipithecus ramidus: the emergence of upright walking.Science, 326(5949), 71-71e6. Thorpe, S. K., Holder, R. L., & Crompton, R. H. (2007). Origin of human bipedalism as an adaptation for locomotion on flexible branches. Science,316(5829), 1328-1331. Previous post: Was “nutcracker man” a seafood fan?